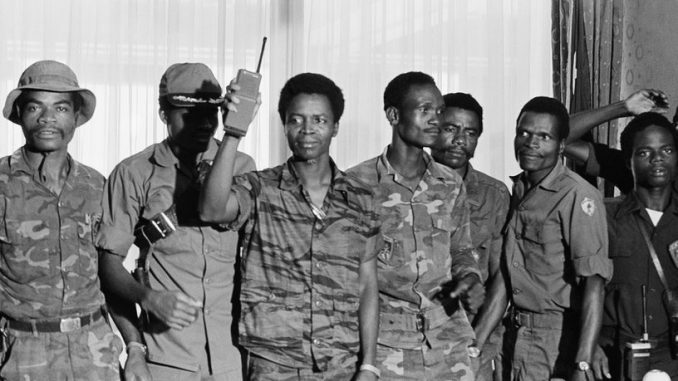 38 years ago, a group of soldiers changed the course of Liberia’s history. Seventeen soldiers, under the command of master-sergeant Samuel Doe, penetrated the Executive Mansion in the country’s capital Monrovia, killed the guards while working their way to the sleeping quarters, and brutally murdered President William R. Tolbert, Jr., the country’s 20th president. At 6 a.m. I woke up to the sound of automatic weapons at a friend’s house in the Sherman compound in the outskirts of Monrovia. ELBC radio soon confirmed what had happened the previous night. William R. Tolbert, Jr. was the country’s last 100% Americo-Liberian president. He was the descendant of African-Americans who had created the colony and later the republic of Liberia, 160 years earlier. In 1985 Samuel Doe rigged the presidential elections, defeated his opponent, Jackson Doe (no relation) and became Liberia’s 21st and first indigenous president – though not really democratically elected. His poor parents belonged to the Krahn tribe. Doe’s rule became the prelude to a savage civil war, the country’s First Civil War, that raged between 1989 and 1997. His successor, warlord-president Charles Taylor was the son of an Americo-Liberian father and a Gola mother. He turned out to be one of the worst criminals of the African continent and ended up in an English prison, locked up for 50 years, probably till the end of his life. Charles Taylor was condemned for war crimes in neighboring Sierra Leone, but not for the atrocities he ordered his NPFL fighters to commit in Liberia. His departure ended the Second Civil War (1999-2003) that left the country devastated, the economy in ruins, and the population traumatized. According to the Constitution, his Vice-President Moses Blah briefly served as Liberia’s 23rd president. Blah was of Gio descent and thus became Liberia’s second indigenous president – though not elected in his own right. In 2005 Ellen Johnson Sirleaf won the presidential elections, defeating her opponent, world famous soccer star George Weah. Her father was the son of a minor Gola chief and one of his wives, her mother was the daughter of a Kru market woman and a German trader. Ellen Johnson Sirleaf became Liberia’s 24th president and served two terms (2006-2018). She was Liberia’s and Africa’s first democratically elected female president. Since both her father and her mother were raised in an Americo-Liberian family, she is considered Americo-Liberian by some observers – though she does not identify as such, specifically not after the 1970s when she briefly served as President Tolbert’s Finance Minister. Be that as it may, President Sirleaf managed to keep the country peaceful, with the help of a UN force, UNMIL. In 2018 she turned the key to the Executive Mansion over to her erstwhile opponent, George Weah, who had won the 2017 presidential elections. Reportedly, George Weah is of mixed Kru, Gbee, Mano, and Bassa heritage. Since the elections were democratic, peaceful, with multiple candidates and according to the law, George Weah in January 2018 not only became Liberia’s 25th president but also the country’s first democratically elected indigenous President, a historic achievement. Two hundred years after Liberia was created – first as a colony of a private American organization (the American Colonization Society), 1822-1847, then as Africa’s first republic (July 26, 1847) – the indigenous people of the region are no longer ruled by descendants of the freed slaves who had created the republic in 1847. The small Americo-Liberian elite, representing less than 5% of the total population, had excluded and marginalized the country’s tribal population and monopolized the political and economic power during 133 years, till that night, 38 years ago, when an indigenous master-sergeant seized power in one of Africa’s bloodiest military coups. All this came to my mind when I woke up this morning, April 12, 2018. Many people in Liberia have neither access to modern education nor to decent health facilities – and so on. I wish them a better future. Students in Liberian schools, colleges and universities lack books that tells them about their country’s history. To satisfy their needs – at least partially – and for everybody interested in Liberian affairs, I like making a small contribution and recently started updating my website on Liberia’s Past and Present, with the precious technical help of my wife for 45 years, and I will continue to do so in the near future. You’re invited. This entry was posted in 1847, 1980, 1980 coup, 2017 presidential elections, 2018, 20th Liberian President, 21st Liberian President, 22nd Liberian President, 23rd Liberian President, 24th Liberian President, 25th Liberian president, American Colonization Society, Americo-Liberian presidents, Americo-Liberians, April 12 1980, Bassa, Charles Taylor, Civil War(s) Liberia, Coups in Africa, democratically elected indigenous president, elections, elections fraud, Elections in Liberia, Ellen Johnson Sirleaf, Executive Mansion, freed slaves, Gbee, George Manneh Weah, George Weah, Gio, Gola, health, international soccer star, Jackson F. Doe, Krahn, Kru, Liberia Past and Present website, Liberian Economy, Liberian History, Mano, military coup, Minister of Finance, Monrovia, Moses Blah, murder, peace, People's Redemption Council, Samuel Kanyon Doe, Second civil war 1999-2003, Sherman, Sierra Leone, Sierra Leone Special Court, UNMIL, William R. Tolbert Jr.. Bookmark the permalink.